In the spring of 2007, a student, Robert Rotundo, approached the Purdue Reamer Club with the idea of placing a memorial on campus. The idea, presented at first only to a couple of student organizations as well as the President's Round Table, caught fire from the beginning. The student who proposed the idea needed an organization to help make the concept a reality. 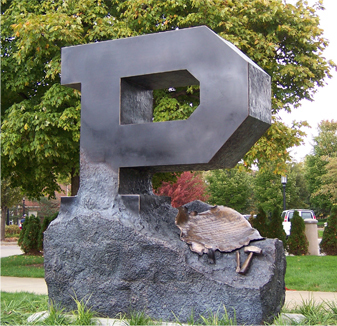 An unfinished "Block P" was envisioned to represent those students whose time at Purdue was cut short for one reason or another. The student, who had seen many tragedies happen during his tenure at Purdue University, wanted those who had passed away during the time they were enrolled as students to have a permanent memorial on campus. It was also this student's goal to have the "Golden Taps Ceremony" conducted at this memorial. There is currently no such memorial on Purdue's campus. With input from many students and members of the Purdue University faculty and staff, the current rendering of the "Unfinished Block P" was formed. The meaning of the "Unfinished Block P" has also grown. At first, the memorial was going to be in honor only of those students who had passed away while at Purdue. However, the basic concept has evolved to symbolize that all students, alumni, community members, and friends of Purdue University are a work in progress and will never be completely finished growing and learning. Since the original proposal, a group of student leaders on campus took the initiative to create an "Unfinished Block P" statue made of bronze. A vision statement was developed to convey the meaning and will be placed on the statue in the form of a scroll. Throughout the duration of the project, the ideas of the original proposal have been kept in the forefront of conversation and design. Obviously, not just anything can be placed on campus property without some process for approval. The "Unfinished Block P" project was no exception. First, and foremost, the group knew that the use of the "P" itself would need to be cleared; therefore, the Purdue Marketing and Communications Office was contacted. The group requested and received copyright approval for the artists to work on the project. To make sure all the appropriate channels were followed, one of the faculty advisors suggested consultation with the University Architect's Office. A representative of that office advised of the existence of a recommended process for placing art on campus and that there are a couple of faculty subcommittees that provide input into artistic and landscape activities on campus. Having served as chair of the Faculty Senate at Purdue one of the honorary Iron Key advising faculty members knew something about the two committees and communicated with faculty engaged in those committees. A series of meetings evolved which resulted in some suggested revisions to the original model of the "Unfinished Block P," and they also suggested rethinking the location of the project. Based on these recommendations, the group worked with Rita and Rick Hadley, the two artists, and changes were made to the project that met with eventual approval of the two faculty committees. Meanwhile, the Office of the University Architect designed a landscape plan that incorporated a new location. This design was also presented to the two faculty sub-committees and gave them a more comprehensive understanding of how the vision would fall into place and how it would look once in location. Needless to say, the group learned a lot about communication, compromise, persistence, and negotiation through the process. While some compromises were made, members of the faculty and University Administration also gained respect for the message desired through the project. They listened to the students' concerns relative to making too many changes that would have diminished the message and the passion felt for the overall project. Looking back, what helped with getting this project off the ground was a gift from the June and Charles Bertsch Foundation from Warsaw, IN. Through their generous gift, funding was made available for the artists to create a clay model of the Block P. This model has been used extensively to help all those mentioned above to visualize the project in its planned form. The clay model also will be used for creating small bronze replicas of the final project, some of which can be given to families of students who died during the time they were enrolled at Purdue. The desired business plan is to market replicas so that a fund is established to help maintain the landscape, continue maintenance of the Block P, and continue creating replicas to present to families at Purdue Golden Taps ceremonies (http://www.purdue.edu/advocacy/parents/goldenTaps.html ). While the gift from the Bertsch Foudation helped get the project off the ground, it was the generosity of two major donors and multiple gifts from recognized Purdue student organizations, alumni, and friends that have made the project a reality. One of the major donors wishes to remain anonymous, and we greatly respect the donor and his/her/their wish! The other key donor was life-long member of the Purdue family, Mr. Rex Sebastian of Dallas, Texas. Rex was a 1951 Purdue University graduate. As a student he was on the football team, and very involved with his fraternity and several student organizations, one of which was Iron Key. Unfortunately, this past August (2008) Mr. Sebastian passed away. Gratefully a core group of the original student leaders had the opportunity to meet with him over the summer to thank him personally for his generosity and get to know this caring, loyal alum. Mr. Sebastian, the anonymous donor, and all other contributors have served as exemplary examples of what it means to give back to the community in ways that exalt others. There is no doubt in the minds of the student leaders behind this project that the successful realization of reaching their goal of leaving a lasting icon on campus will motivate them to other successes throughout their lives and, like the donors, they, too, will become more and more productive and successful in their chosen careers. This is what the Purdue experience does for our students.